umpkin Loaves - this makes a moist and spicy bread that is perfect for the fall. Home » Bread Recipes » Pumpkin Loaves – this makes a moist and spicy bread that is perfect for the fall. Pumpkin Loaves – this makes a moist and spicy bread that is perfect for the fall. This is a great bread to make in the fall. It is very moist, and makes for a hearty breakfast. This recipe is from the archives of Ethel Eynard, my grandmother. Jefferson City, MO. 1975. 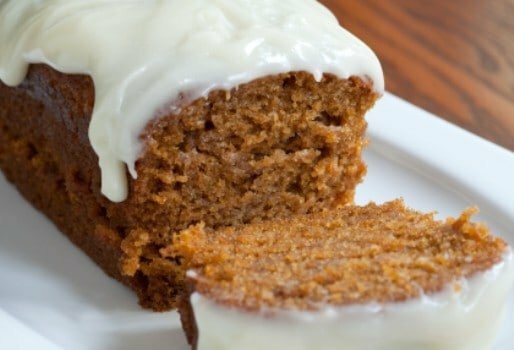 Pumpkin bread loves are a perfect way to enjoy the flavors of fall any time of the year. Lightly grease four small loaf pans and preheat the oven to 325 degrees. Sift flour with salt, baking powder, soda, and spices; set aside. In large bowl of an electric mixer on medium speed, beat sugar with butter just until blended. Add eggs one at a time, beating well after very light and fluffy. Beat in pumpkin. At low speed beat in flour mixture until combined. Turn batter into greased pans, dividing evenly. Bake 1 hour, or until a cake tester comes out clean. Let cool in pans 10 minutes. Turn out onto wire racks to cool completely. Do you have a recipe for the icing? Does anything change for high altitude baking? This was great pumpkin bread. It was an accidental omission on my part, the baking soda is back in.